← #33 “Who Mourns for Adonais? Hey, this is my 500th post! Here’s today’s flashback; Another installment of Media Spotlight. This time it’s “Inside Science Fiction” by Jackie Lichtenberg, where she reviews the latest sci-fi related projects by our favorite Trek stars. Especially noteworthy is the LP album Inside Star Trek, which I remember buying at the time for @ $8.00, a big chunk out of my budget for the time. It featured Gene Roddenberry chatting with De Kelley, Bill Shatner and most notably Mark Lenard as Sarek, discussing the fascinating ordeal of Spock’s birth. I still have that LP somewhere, although nowhere to play it! The article also mentions that fans should get a hold of Leonard Nimoy’s recordings of The Martian Chronicles, although they might be a bit too expensive for your average geek’s wallet. 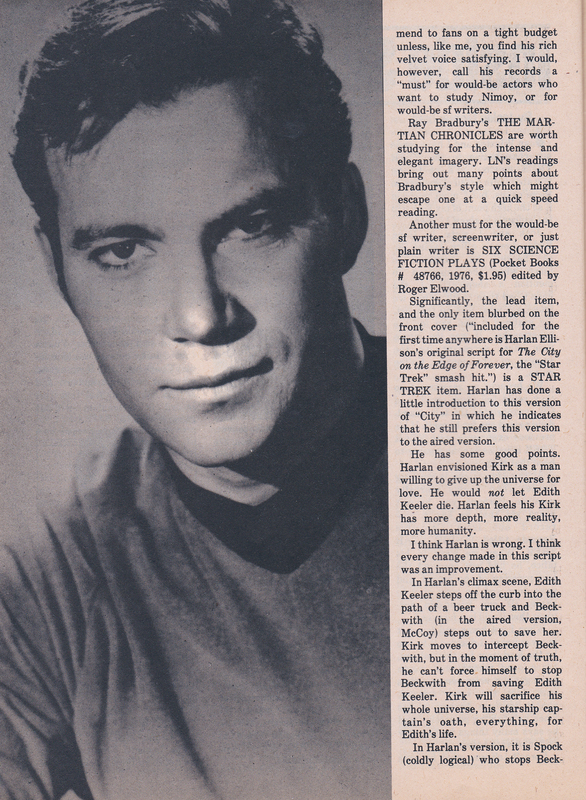 The author extols Nimoy on his “rich, velvet voice”. 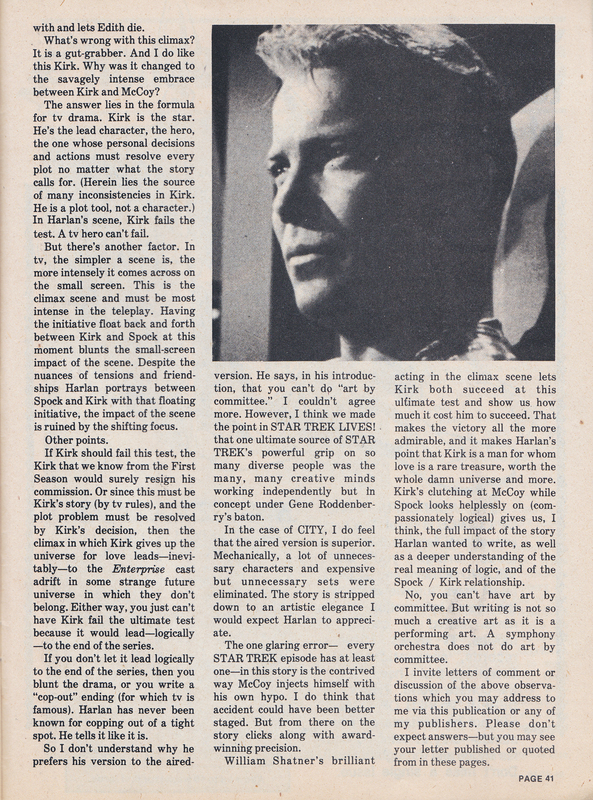 There’s also interesting insights on how “The City on the Edge of Forever might have been if writer Harlan Ellison had his way (a footnote of Star Trek production legend is about how much Ellison hated the way his original script was edited into the legendary episode that aired. (To his credit, Ellison won a Writer’s Guild of America’s Award for his original teleplay). 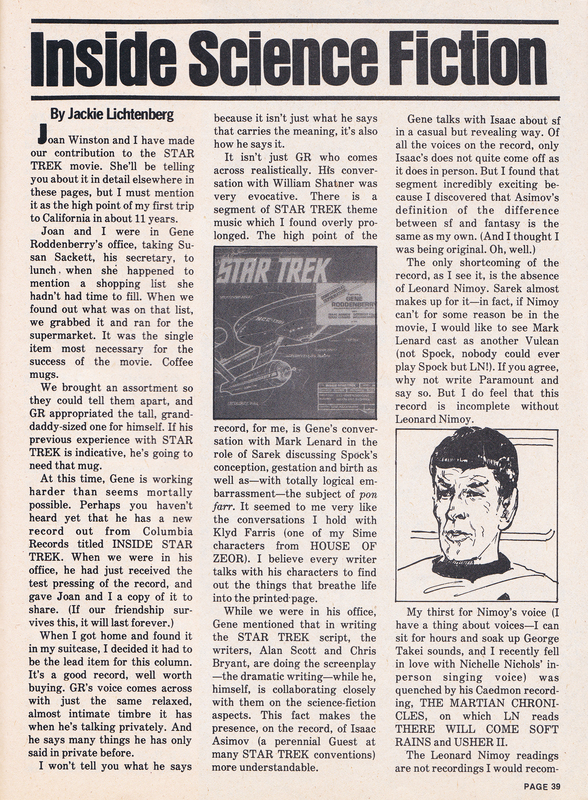 This entry was posted in Leonard Nimoy, My Star Trek Scrapbooks and tagged Deforest Kelley, Gene Roddenberry, Issac Asimov, Leonard Nimoy voice, Mark Lenard, Media Spotlight, Star Trek, WIlliam Shatner. Bookmark the permalink. That was a great read. Didn’t like the Nichols interview of yesterday, but this was fun. I still have a record player and records I want to but haven’t fed into my computer device. Looks like my library threw out the Nimoy/Bradbury…love Bradbury but he’s not the best reader of his work.